Paris with teenagers. Sigh. I can hear you all sighing at the idea of Paris in a very “we’ll always have Paris” way. Me? 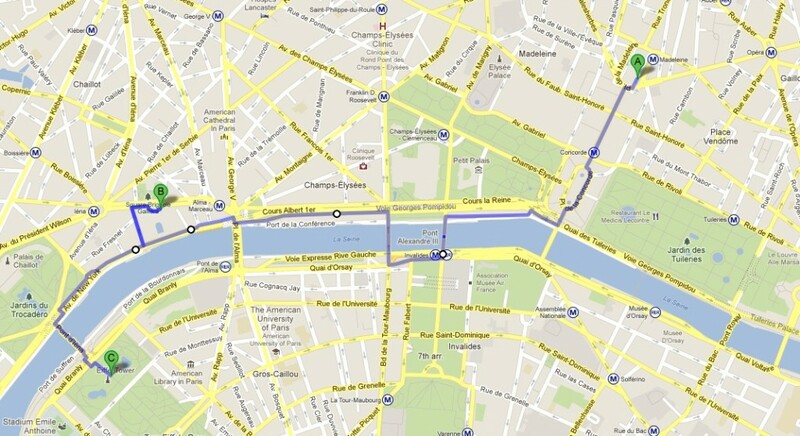 I’m wondering what to do with two digitally-obsessed teens for a week in Paris. This is a new kind of family travel planning, but I’m always up for a challenge so here’s what we’re considering (with a little input from said teens). This year we kicked around ideas for where to go and what to do for Thanksgiving with our boys and BigB announced “I’d love to go to Paris, I’ve never been*”. Ahem, honey, yes you have – here’s a photo of you and me on the Eiffel tower. Given that he was only two at the time, we forgave his memory lapse and agreed that Paris seemed a fine place to go for a few days in November. Our first tourist stop will be the famous tower to jog his memory. Not for the architecture. Not for the famous people buried there. No. Me and my geeks-in-training are going to see Foucault’s Pendulum. Yes, we’re going underground, no, not to go see pretty pictures at the Louvre, we’re going to look at the bones of six million dead Parisians. In a word macabre but I bet my kids will be more interested in spotting odd occipital structures than they would be admiring the lines of Mona Lisa’s famous face. You can’t go to Paris without visiting at least one museum and this is the one my kids chose. It’ll be different. I reserve the right to pass on this one and go spend some mom-time at the Musee D’Orsay (which, very conveniently, is just above). Jim Morrison. Edith Piaf. Oscar Wilde. Samuel Beckett. There’s a lot of famous people buried in Paris. I figure we’ll indulge the teen cool factor with a pilgrimage to Jim Morrison’s bones and then trade that goodwill for a trip to Versailles. *He actually also said ” and we could go see the places mentioned in The Sorceress” but since he read that when he was a very uncool 10, I’m only mentioning it here in passing. Leave a note and let me know if there’s any other teen-friendly Paris sights or activities you think we shouldn’t miss. (But mention Disneyland Paris and I’ll un-friend you I swear). 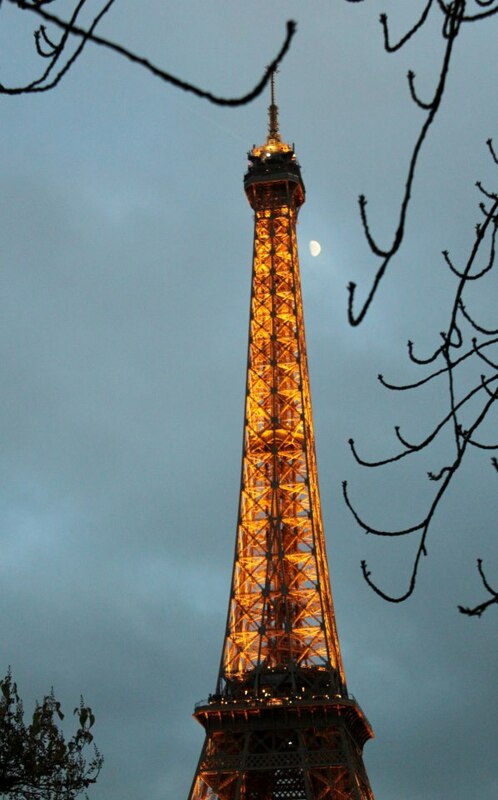 This entry was posted in France and tagged France, Paris on October 15, 2012 by wandermom. Picture the scene: an extended family group enjoying a day in Paris before taking the train to historic Poitiers. It’s about lunchtime and the group has stopped to review lunch options in a narrow street lined with small cafes. 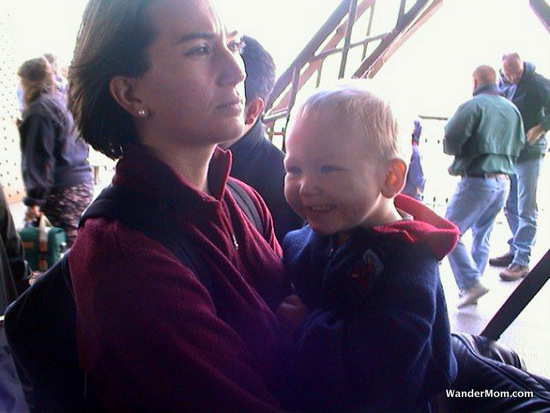 And then WanderMom notices that her two-year-old has slipped out of view. Frantic, she alerts the rest of the group and everyone’s attention is immediately focused on finding the child. Within seconds, WanderDad starts laughing, pointing into a nondescript cafe-tabac just a couple of doors from where the group had originally been standing. This little guy is a kid who just loves his eggs, and is very serious about his food. And he’s a child, who even at two, was ready to take charge of his own destiny. While the adults were deliberating what and where to eat, he spied the customary wire rack of hard-boiled eggs on the counter of the cafe-tabac. 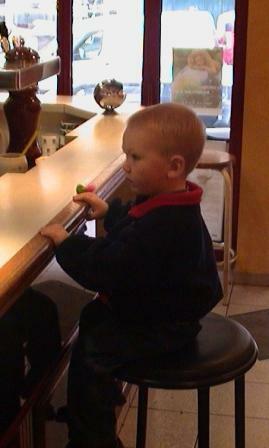 Being used to high counter stools from home, he perched himself up on one and without a word of french was negotiating an egg from the proprietor when his Dad spotted him. 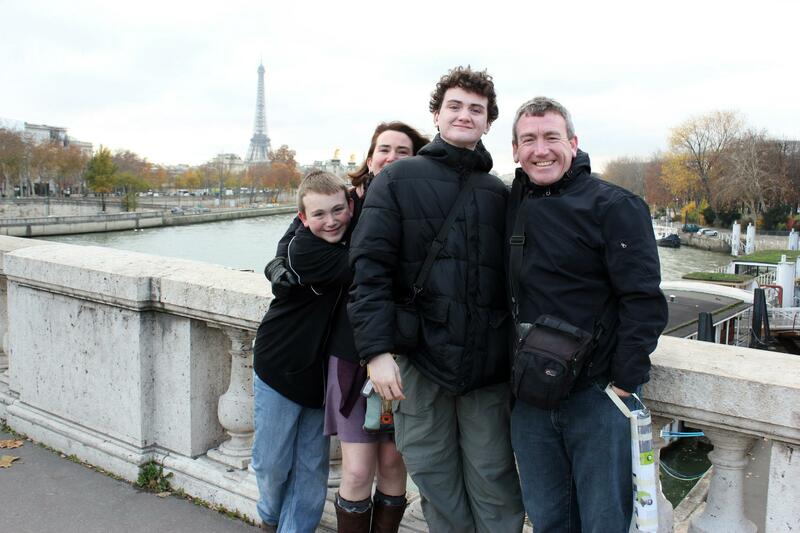 This entry was posted in France, International Escapades, Kid Travel Photos and tagged France, Paris on February 19, 2009 by wandermom.